It feels like ages since I blogged even though it was only couple of weeks. Busy schedules and work are taking a toll on blogging these days and I hope I am not disappointing my readers too much. Recently few of my friends reminded me about my absence in the blog which made me revive this recipe from my draft. It’s a blessing to be surrounded by people who cares, encourages, motivates and inspire you in many ways. Last year I was able to pull few of my family members from their comfort zone and had them participate in the 5k run. This year none of them were able to participate in the run due to a pre-committed engagement. But we had another group to compensate. Few of my friends decided to participate. You can imagine how fun it is to have a girl’s day out. Each one of us thoroughly enjoyed the practice runs, the girl talks and some goof ups and silliness we shared during these days. It reminded us of college days. The beautiful scenic view near the lake uplifted the spirit of the run. The scattered rain before the event tempted us to act silly by making our own blue fancy looking trash bag ponchos. We were little embarrassed to wear it at the beginning, but then we saw lot of people around us in black trash bags..lol, which soon made us realize that we were part of the herd :). It was a fun filled morning. The great achievement was that we did better than our practice run on the day of the event. We hope that we can motivate many more around us! 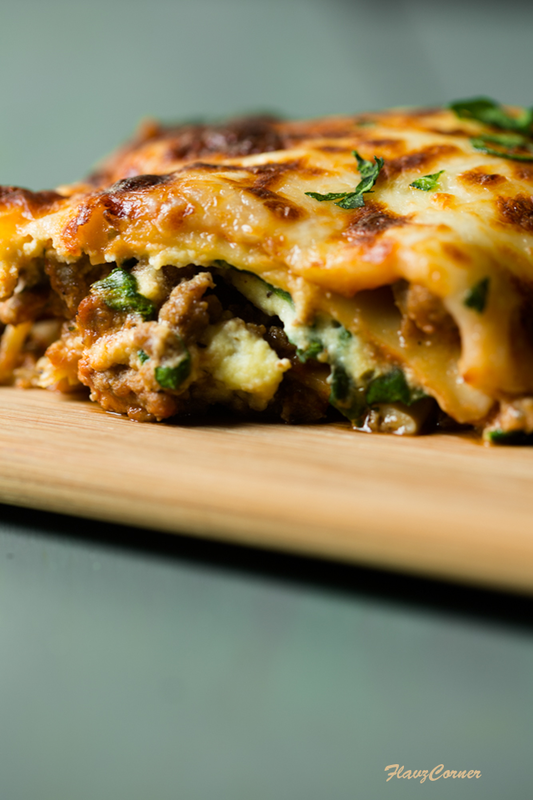 Today's recipe is a delicious Lasagna with browned turkey and spinach. The perfectly seasoned browned turkey is something that tempts me to snack on it while preparing the rest of the ingredients for Lasagna. 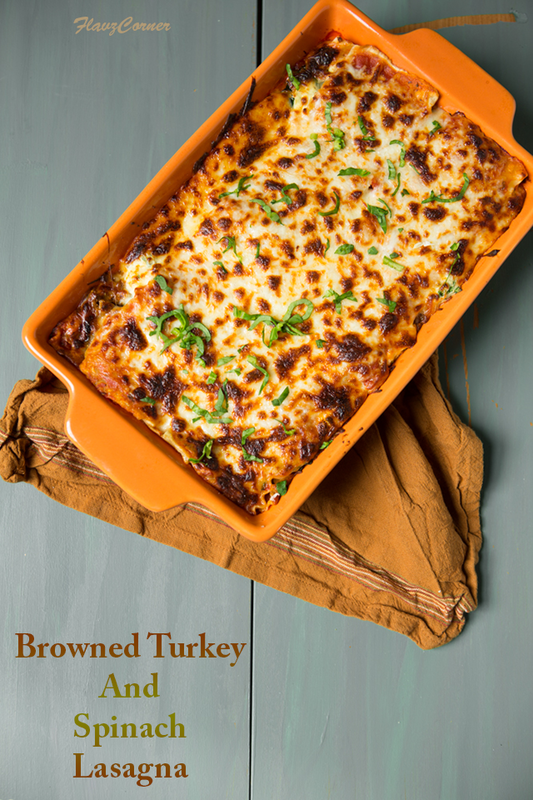 Trust me, you will end up gobbling a handful of browned turkey before layering into the Lasagna. Its that good. So please try this recipe and let me know how it turns out for you. 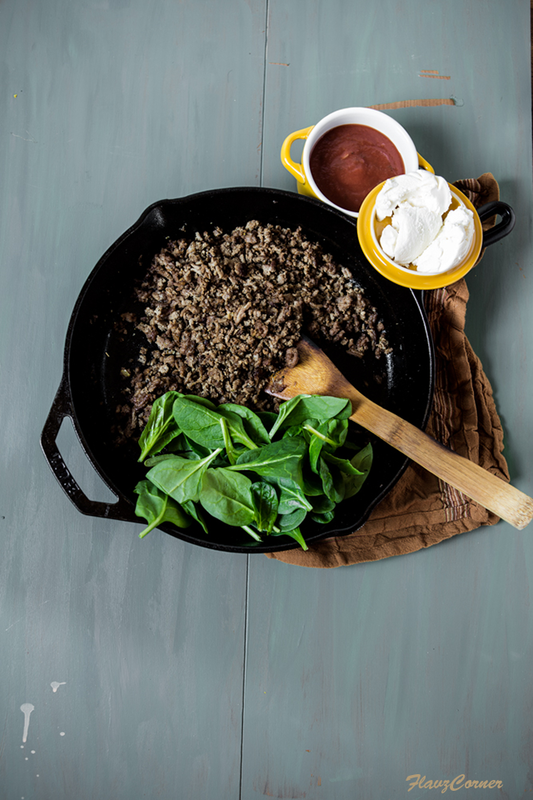 Heat 1 tsp of olive oil in a cast iron or non-stick pan and roast the minced garlic till golden brown. Add the ground turkey, salt and pepper and cook till it is browned. Keep the cooked turkey aside. 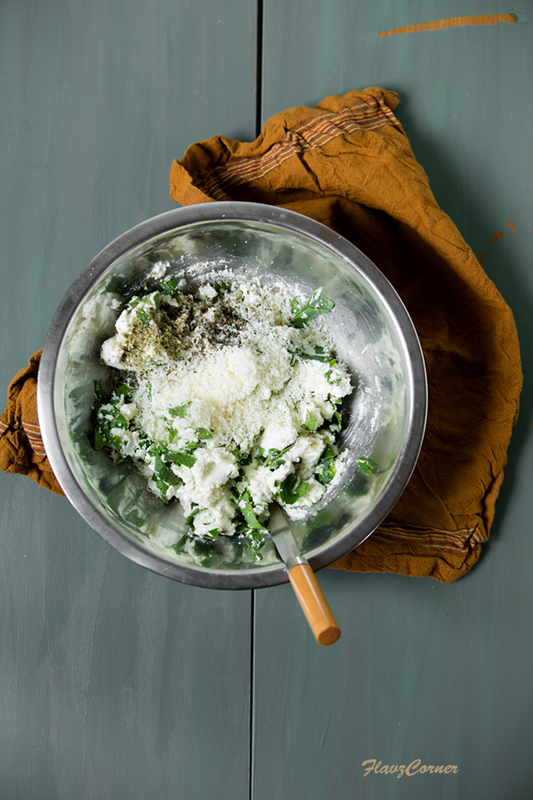 While turkey is cooking, you can make the filling by mixing egg, ricotta cheese, chopped spinach, salt and pepper. Take a sauce pan and roast the crushed garlic in 1 tsp of olive oil. Add the tomato sauce and Italian seasoning. Bring to boil and simmer for 5 minutes. Add the cooked meat to it and turn off the flame. Cook the Lasagna noodles according to the package direction and drain. Pre-heat oven to 375°F and grease a baking dish with cooking spray. Spread 1/2 cup of sauce and meat mix in the baking dish. Arrange 4 noodles over the sauce. Spread half of the ricotta spinach filling on the noodles. Top with 3/4 cup of Mozzarella and Parmesan cheese mix. Spread 1/2 cup of sauce and meat mix. Top it again with 4 noodles. Repeat the layering and finally top the last set of noodles with meat sauce and rest of the cheese mix. Cover with an aluminum foil and bake for 25 minutes. Remove the foil and bake for another 15-20 minutes or till the cheese melts completely and the top gets golden brown. Let the Lasagna cool for 15 minutes. Garnish with chopped basil before serving. You can set the Lasagna a day before and refrigerate it till ready to bake. Use a thick tomato sauce to get a nice textured lasagna, otherwise the sauce will be too watery and the Lasagna will not set properly. 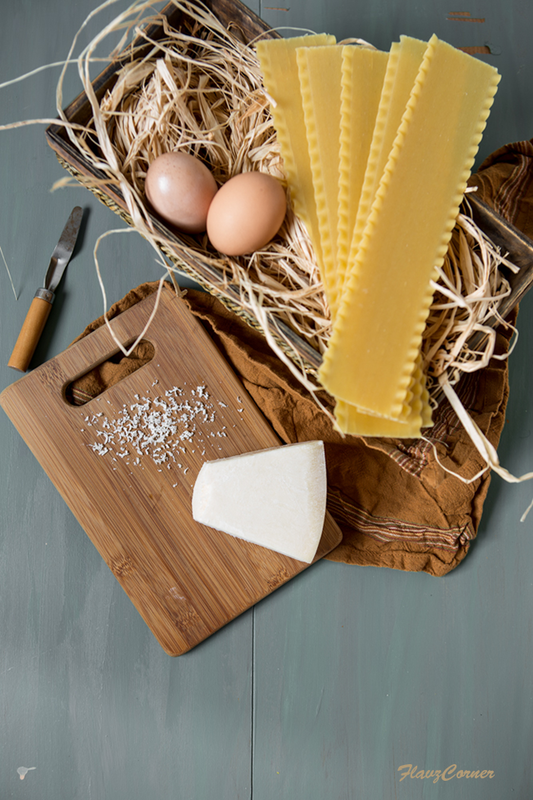 You can use any meat of your choice in the Lasagna. Lightly browned meat with proper seasoning adds more flavor to the Lasagna. Cast iron pan works better for browning the meat. Make sure to cook on low heat without burning. Good to see a post from you! And what a wonderful recipe you're sharing with us today. I love lasagna, and it's been ages since I've made one. And I've never made one with turkey -- love the idea. This looks SO good. Thanks!